The Average Directional Index (ADX) indicator measures the strength of a prevailing trend as well as the degree of movement in a market. The ADX is non-directional and helps validate the strength of a trend regardless of whether the trend is bullish or bearish. An ADX value of less than 20 typically indicates a market that is not in a trend. 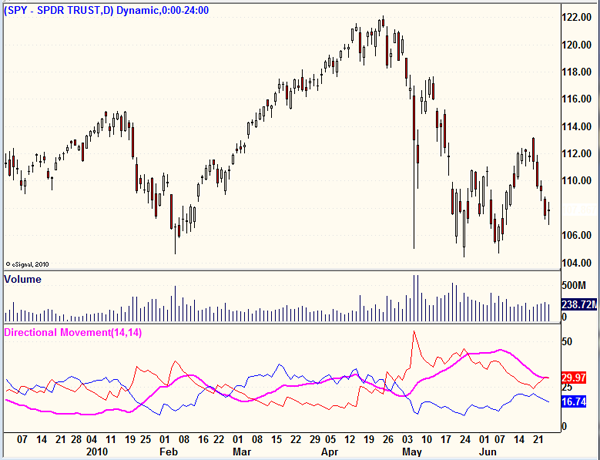 A move above 20 can be an indication that a trend (either up or down) is beginning. If the ADX is over 40 and begins to fall, it can be an indication of a possible stall or reversal (drop) in upward trending price movement.